I was woefully unprepared for my visit to the extreme Southwest corner of China. Working on a project with Cathay Pacific and InterContinental Hotels, I had researched every other aspect of my trip in China except for Xishuangbanna. I couldn’t pronounce it, there isn’t all that much online about it and I just figured that I would work it all out once I landed. 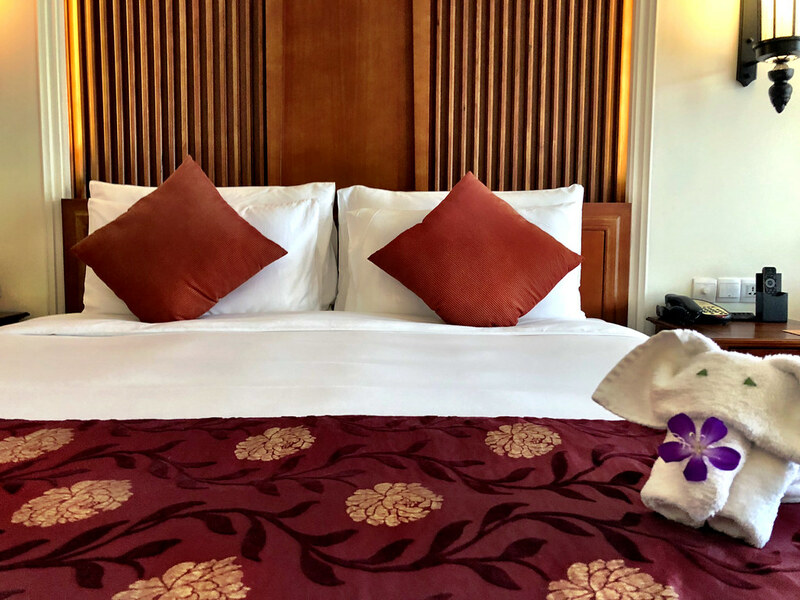 Turns out that hunch proved to be a smart one, thanks in large part to my caretakers for my time in Banna, the fine folks at the luxurious InterContinental Xishuangbanna Resort. I’ve been working hard to convince everyone that this is an area of China that demands a visit so, if I’ve succeeded, then I also need to share where you should stay. Luxury options are limited, but my experience at the InterContinental was extraordinary in almost every way. So, today I want to share why you should have this getaway on your travel bucket list. The first few hours after my arrival into Xishuangbanna I was a little confused as to which country I was still in, and the resort is largely (and wonderfully) to blame for that. 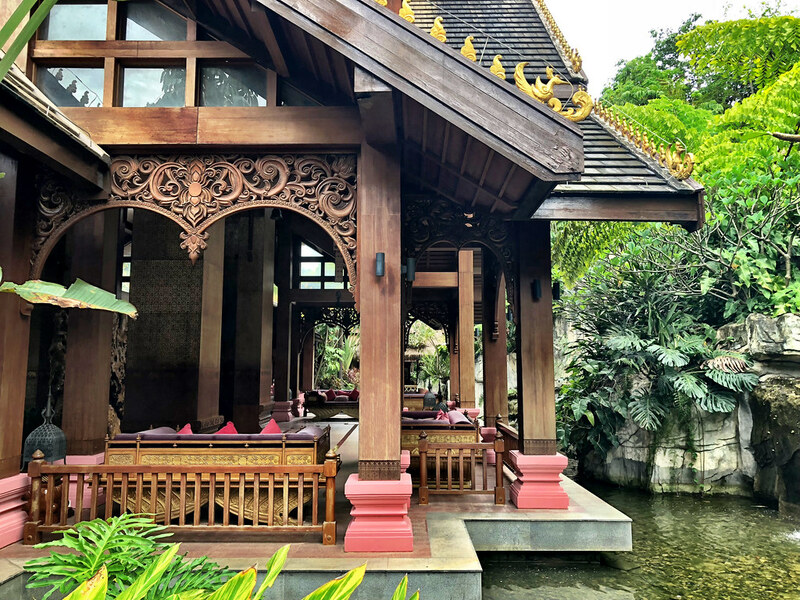 They’ve created what looks like a Thai mansion, complete with all of the touches I’d expect to see from the gorgeous teak woods everywhere, to small design embellishments that are so common throughout the region. Walking through the lavish open-air lobby was the ideal introduction to what was a relaxing and calming experience. That was actually the theme of the stay, relaxation. The kind staff members were there not to bother or inundate me with superfluous information, but to help me get to a place of peace as quickly as possible. I’m not entirely sure I’ve experienced that before and while at first a little unnerving for a Type-A individual like myself, it ultimately was an amazing touch that transformed the hospitality experience. Just as service is at the heart of the experience at the InterContinental Xishuangbanna, so are creature comforts. Walking into my room I was met with the type of escape I love. Hardwood floors, luxurious linens and fabrics, an expansive patio and more small touches and embellishments than I can name. That comfort wasn’t just confined to my room, it was everywhere at the large but still homey resort. 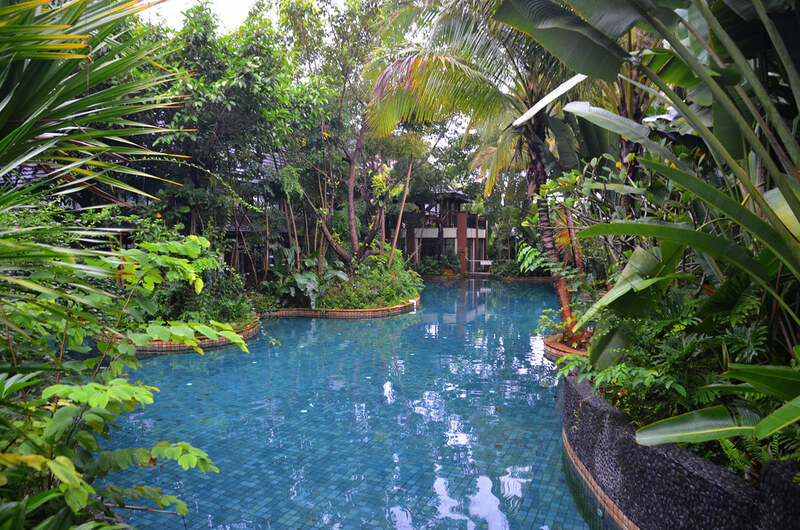 That’s a hard feat to manage, but at this tropical getaway it’s been accomplished with apparent ease. Other than the inherent comfort, the other highlight of my time at the InterContinental Xishuangbanna were the culinary offerings. In the last decade or so, hotels around the world have dramatically stepped up food and beverage options and that’s on clear display in Banna. With several restaurants on-site, each offering different styles from creative chefs, it’s possible to have a dramatically different food experience every night of your stay. There were two standouts for me: the Man Lin Chinese Restaurant and Lotus Thai. 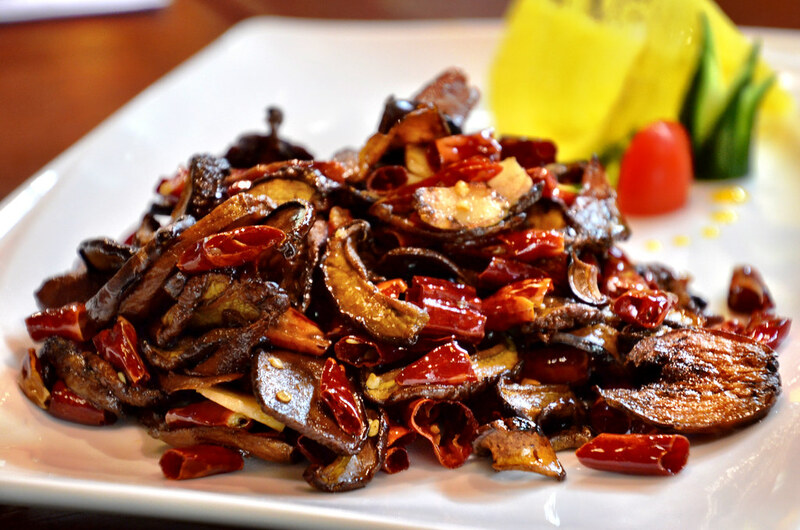 Drawing on local traditions and tastes, Man Lin executes contemporary Chinese cuisine with ease. They also heavily rely on what is in season, as my tasting menu full of freshly found mushrooms quickly showed. Lotus Thai though was a special dining experience, not only for those Thai flavors I know and love, but for incorporating traditional cuisine from the local Dai people. One of the largest ethnic minority groups in the region, tasting the flavors and nuances of their traditional food staples was a treat I know that I will never forget. I love hotel lounges and always book them when they are available. 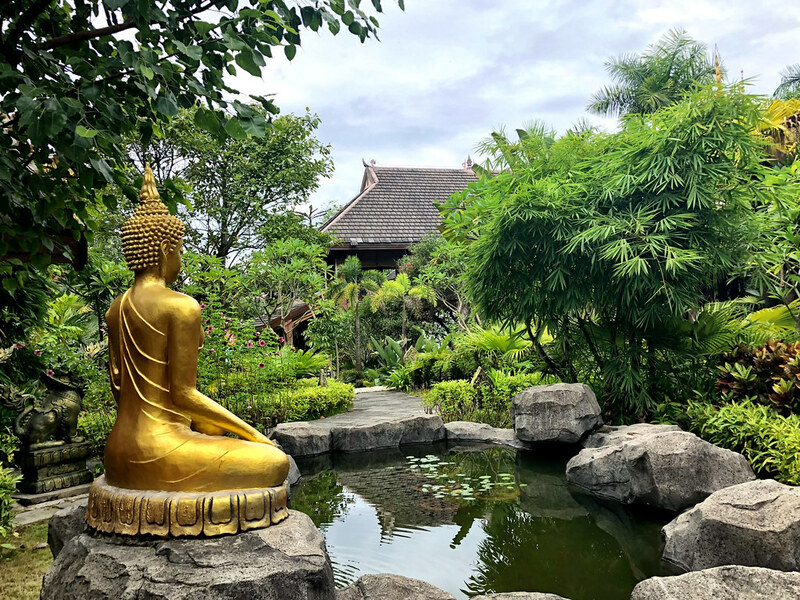 They add so much to any hotel experience and in Xishuangbanna I found what surely must be one of the best InterContinental Club Lounges in the world. Drawing on the graceful Thai design found throughout the property, the two-story lounge took my breath away as soon as I walked in. Once again, the attention to detail is remarkable, and I felt like a true VIP whenever I sought refuge in the lounge. With several food options offered throughout the day, it’s the ideal place to enjoy breakfast, a midday snack or tea and definitely cocktails and hors d’oeuvres before dinner. Add to that truly incredible concierge service from Club Lounge staff, and this is the ideal way to add some luxury to what is already an incredibly luxurious hospitality experience. I spent a lot of time on social media comparing Banna to Thailand, and looking back at that now I don’t think it was quite fair. Yes, absolutely everything about the region reminded me in every conceivable way of Thailand, but there’s one important thing to consider – it’s not Thailand. This is a very unique part of not only China but of the world with its own distinct culture, traditions and lifestyle. China landscapes and temples in China vary widely, something important to keep in mind. I ignored that at first by simply labeling them as a cross-cultural phenomenon, but thankfully I realized my mistake in time to learn more about the area and people who live there. One of the best ways I learned to appreciate the region was by spending time with some members of the local ethnic minority groups. Several ethnic minorities call the region home, but the one I saw the most of were the Dai people. The name comes from the word Tai and, yes, they are very closely related to both the Lao and Thai people. At one point in their history they were nomadic, which is why the culture of the Golden Triangle today can’t really be isolated by national boundaries, but by a broader geography instead. These clues to cultural identity for me were actually best seen in the local Buddhist temples. The style and shear number of them again mirror what one finds in other areas of Southeast Asia, and the Dai people have added their own customs to the practice of Theravada Buddhism. Extremely large gongs and bells form the cornerstone of many folk dances and music, common during festivals like Songkran. It was really their history and traditions that taught me the most during my time in Banna, whether at a night market stall or walking through mist covered tea plantations set amongst the rolling hills. Xishuangbanna is a special place and it quickly won a place in my heart, as did the luxurious InterContinental Xishuangbanna Resort. Tucked away in a relatively unknown corner of China, this is one of those great travel treasures I love to discover.